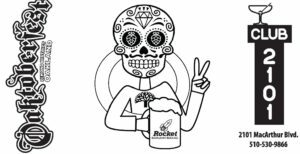 Thank you for your 2018 Stein Art Competition submissions. Stay Tuned for 2019! Would you like to have your artwork hoisted by thousands? 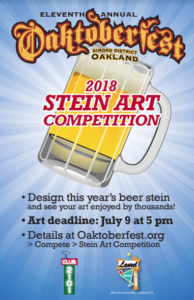 Would you love to see your work proudly framed on the Oaktoberfest Event Stein? 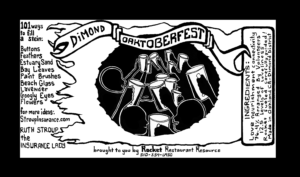 The stein is a festive and fun part of the annual Oaktoberfest in the Dimond community fundraiser festival. 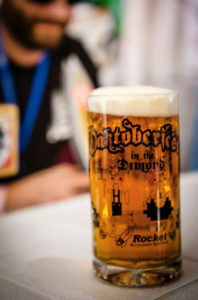 Oaktoberfest is looking to all you Oaktoberfans for the perfect image for this year’s festival. The top three submissions will win fabulous prizes! 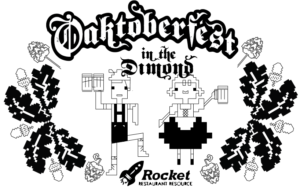 The artwork submission and contest is for printing on the Oaktoberfest in the Dimond glass event steins. Artwork should be festive and suitable for all ages and meet the criteria described below. Come out to see the amazing stein art! Congratulations to the 2016 Stein Art Competition winner, Lauren Langford! Congratulations to the 2015 Stein Art Competition winner, Stephanie Noack! Congratulations to the 2014 Stein Art Competition winner, Kristi Holohan! Thank You to both of our winners for helping the reflect the talent in our communities! Artwork of Contest prize winners maybe used by Oaktoberfest for promotional purposes and in promoting the event as desired by Oaktoberfest in the Dimond in perpetuity.